One result of our Locally Grown podcast with City of Northfield Finance Director Kathleen ‘Mac’ McBride back in June: this Locally Grown CIP draft Straw Poll. The primary purpose of this CIP draft Straw Poll is to encourage more of the citizenry to get engaged in thinking and talking about the CIP so that more poeple will use whatever other means (phone, email, F2F, open mic, etc.) 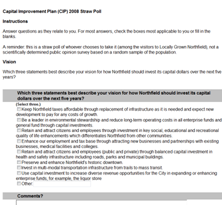 to communicate with Northfield City Council members about it. It can be completed in 5 minutes or less. We’ll keep it open for the next week or so, probably ending it on June 29 so we can discuss the results on next week’s podcast. We’ll use the comment thread to post alerts as it comes to a close, or if we change our collective minds about ending it on a different date. There are some techie tools in place to prevent people from taking the straw poll more than once. But you wouldn’t anyway, would you? There are comment boxes for each section, so feel free to take your time to opinionate and make suggestions. If you’ve been reluctant to participate in our online discussion about the CIP, yet have some comments you’d like to make known, this is the perfect opportunity for you. The results of the CIP straw poll, including all civil comments, will be packaged up into a PDF for city staff and the Council to read, as well as posted here on LoGroNo. This straw poll is for whoever chooses to take it (among the visitors to Locally Grown Northfield, obviously), not a scientifically-determined public opinion survey based on a random sample of the population. So don’t argue that the results should directly impact decision-making at the Council level or we’ll ask the math police to track you down and have you lobotomized. Here’s the link to the CIP draft (PDF). Feel free to peruse it before, during, or after you take the CIP draft Straw Poll. Straw poll results are coming in s l o w l y but surely. A baker’s dozen so far. Build a new library in another part of town to serve more of the population. I haven’t heard any compelling arguments that the existing Safety Center does not meet current needs, and I’m generally skeptical of projections (and facilities needs’ studies) showing the area’s population expanding radically in the next 25 years. Past trends are not necessarily predictors of post-peak-oil trends! I very strongly feel that city facilities should remain within walking distance of the downtown area, especially the public library. Safety center is must-do; library should be expanded; city hall should be fit in where possible, ie. in old library building, at the Crossing. I like idea of library in spot where city hall is (in a new building) and move city hall to library–much less disruptive to physical plant of library. We need to spend money on things we need, not things that are nice to have. City Hall is deplorable, especially compared to other public buildings, like the new Middle School. 20 citizens have responded thus far to the CIP Straw Poll. Not half bad. I’d like another dozen before we close it down. Forget the skate [park] completely or put it in a small corner of Memorial Park. New ice only if the two colleges contribute great amounts of money. If the public wants these facilities, then at least one-half of the money should be raised privately first. Invest in facilities that differentiate Northfield from other communities. Give the citizens a real, meaningful and unfiltered voice on how their money is spent. If the use of the facility is considered an “essential” service (which now includes library services) city council should have the courage to make the decision on what to build and how much to borrow. The isses can be discussed during the campaign so voters know where the candidates stand on the CIP program and whether they would resort to a referendum for essential services. It depends upon the type of project. In general, public referendums are important, but there are public goods in which the public is sometimes unwilling to invest. An amenity like the outdoor pool, for example, should have been put to a vote. Infrastructure replacement should not. That’s what we pay staff to decide. Last day to take the CIP straw poll. It’s on the agenda for Monday’s Council meeting. Put things on hold until the economy improves and industry and more people come to settle in Northfield. Taking on debt in these hard times is extremely ill-advised. The selection above is based on very limited understanding of the ramifications of expanded debt. We’re in a recession and they’re talking about spending $53 million? The item on Monday’s agenda deals less with specific projects and more with requirements that would allow the City to issue CIP bonds (for city facilities) and Street Reconstruction Plan (SRP) bonds. The two items are continued public hearings from the last Council meeting. The resolutions associated with each – the CIP and the SRP – approve each plan and provide for preliminary approval to issue bonds. No specific project is authorized by this action nor are any bonds actually issued. Both types of debt (CIP and SRP) provide for a reverse referendum. The 30-day clock for submitting a petition to hold a referendum starts ticking when the public hearings close. With regards to the five-year capital improvement plan (the big document not to be confused with the CIP plan related to issuing CIP bonds) is being updated for the next five-year cycle – 2009 – 2013. The initial draft will be out sometime in September. Lots of time for public comment and review. Any large project – City Hall, individual street project, etc. – will be decided upon by specific Council approval. Thx, Mac. Would it be better for me to present the results of the straw poll at a future council meeting instead of tonight? I would suggest you wait until next month so that it comes with the presentation of the next cycle (first round list). But I leave it up to you. Good idea, Mac. That’ll give me time to compile everything into a single PDF/document for prior distribution to the council. I’m not sure if this would be a CIP item but building an underpass running Jefferson Parkway below Division would eliminate the most congested and dangerous intersection in Northfield. I’m sure underpasses are not cheap but the hill is already there.